How could Canada hold a ceremony purporting to represent the essence of the nation without featuring at least ONE Asian carrying the Olympic flag at the end? Asian-Canadians number 3,509,950 so why old, irrelevant Donald Sutherland and not compelling, contemporary David Suzuki? It all looked a little black and white to me, with the First Nations dancing in the first half of the ceremony and then disappeared for the second half to be replaced by a sea of predominantly white faces. Sure, there were a few exceptions among the dancers, but it was the last act that seriously rubbed me the wrong way. Canadians of Asian ancestry comprise the largest visible minority group in Canada, at 11% of the Canadian population, and is the fastest growing. Okay, nobody would trade Wayne Grezky and according to my quick search, they couldn't have anyway, because there aren't yet any notable Asian hockey players. But Canada's notable Asians could fill a volume, and locally, of course, we have a Canada Line full. As Wikipedia tells us, "The city has one of the most diverse Chinese-speaking communities with several dialects of Chinese being represented. Vancouver contains the second-largest Chinatown in North America (after San Francisco's), and many multicultural neighbourhoods such as the Punjabi Market, Little Italy, Greektown, Japantown and Commercial Drive. Bilingual street signs can be seen in Chinatown and the Punjabi Market, and commercial signs in a wide array of languages can be seen all over the metropolitan area." East and South Asians make up almost 28 percent of Vancouver's population. 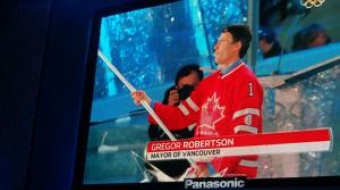 We have a Deputy Mayor of Asian origins and an Asian candidate came close to winning the nomination for the Vision Vancouver that eventually elected Mayor Gregor Robertson in a landslide victory. Boy, VANOC should have consulted Alden Habacon (below), founder and publisher of Schema Magazine and diversity consultant to CBC Television, and gotten in on some of the high energy of the diversity that is Vancouver. 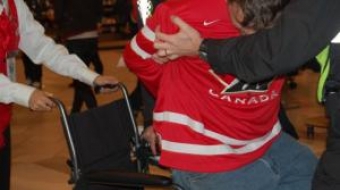 Pandemonium followed Canada's win of the Olympic men's hockey game final yesterday, but it never spilled over into the riot it could have become.